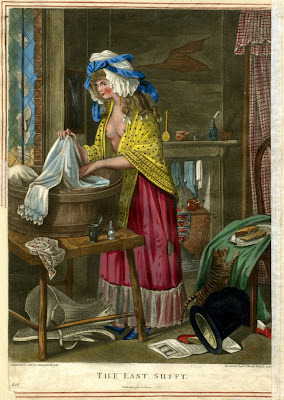 As the woman washes her last shift, (wearing only a large handkerchief to cover her bosom), the stays she was wearing are shown on the floor under table. the stays are of a neutral/natural color, back lacing are still holding the shape of her body. The whalebone has with the warmth of the body taken on its shape. There is probably additional horizontal boning to the interior that is contributing to the boundedness of these stays.